Thursday was "for the birds." 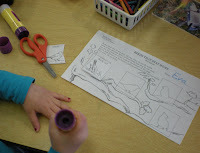 Our winter discussions drifted to some of the animals that are still around and how they get food. One little boy was adamant that they all eat fish. Which I guess was my fault because we were talking about penguins eating fish. But, we got back around to how there isn't too much food around for the birds in the winter, so it's great to make a bird feeder and that's what we did. 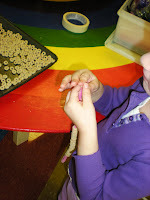 I have made pine cone bird feeders, bread bird feeders, and even ribbon bird feeders. 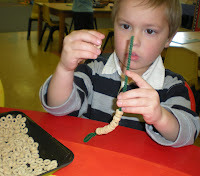 But my favorite is an idea from our local zoo, the pipe cleaner bird feeder. It's quick, easy, and peanut allergy free. Also the children can make as many as they like. All you need are some pipe cleaners and cereal. Loop one end of the pipe cleaner, add cereal, loop the other end of the pipe cleaner, and then hang it in a tree. (Make sure you have enough cereal. It's usually one for me, one for them.) 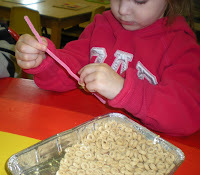 This is also good for fine motor development and hand eye coordination. One little boy was so excited about having the birds come over to his house to eat he made five of them. We always have some kind of coloring out for the children on one of the tables during playtime. I switched it up by adding a cutting and matching bird activity. Not everyone does it, but some of them enjoy cutting these birds out and gluing them in the trees. Now I just hope the birds visit the little ones soon, or I'm sure I'm going to hear about it:). I love the bird feeders. 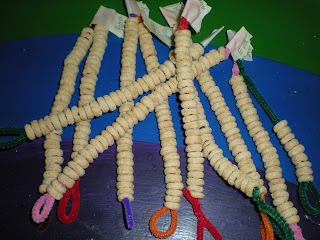 Art, science and fine motor all rolled into one. You say "allergy free," but I still have to check with my authorities. Sorry Tom, I meant to say "Peanut allergy" free. I've done this with my storytime kids, and they get such a kick out of it! Nice to find a great craft that doesn't need scissors and glue. I LOVE this idea! 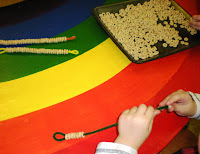 Now that we can't use peanut butter on pine cones, I really haven't done any bird feeders, but I think next week we'll be taking out our pipe cleaners and Cheerios! Love to see the intense workers - such concentration! 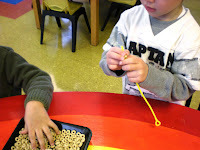 Great fine motor activity as well as helping the birds and squirrels who find those loose crumbs!